We pack a lot into every almond. And every partnership. This single, delicious nut has nearly endless possibilities. Helping you realize the potential is our expertise, and our satisfaction comes in knowing that you’re getting the greatest possible return on your investment. Since our humble beginnings in 1910 as a small grower’s cooperative in central California, we’ve been building long-lasting partnerships with our customers. Today, more than 50% of California’s growers are members of the Blue Diamond family. Every one of them is proud to be a part of the world’s largest and most trusted supplier of almonds. When we partner with our customers, we’re doing more than filling orders. We are filling in the blanks. Asking the right questions. Suggesting alternatives that can optimize your product, from the perfect crunch in your cereal to a flavor profile that complements your yogurt. We have the variety, the forms, and the expertise to meet your exacting specifications, as well as the uninterrupted supply to keep your manufacturing on schedule. A growing business growing almonds. 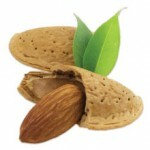 Almonds continue to rank number one as the leading nut in new food products worldwide. To meet the exploding demand in our global ingredients business, Blue Diamond Growers has built a 200,000-square-foot manufacturing and processing plant on 88 acres in Turlock, California. 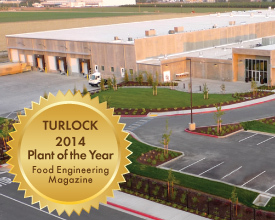 Now our state-of-the-art facility has just been named the 2014 “Plant of the Year” by Food Engineering Magazine. The new Turlock plant has greatly increased our manufacturing capacity and enhanced our capabilities to provide value-added almond ingredients for the greatest food companies of the world. Our commitment to meet the evolving needs of our customers is matched by our commitment to premium quality. As with everything we do at Blue Diamond, this new complex is designed to meet the world’s highest food quality standards – and our products reflect that. Our Sacramento processing operation spans 90 acres and is the largest of its kind in the world. Our second location, in Salida, is a state-of-the-art brown almond processing and shipping facility. Our newest plant, completed in 2013, is located on 88 acres in Turlock, and is the most modern almond processing plant in the world.